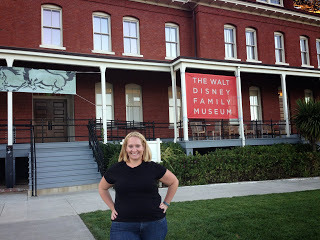 While visiting San Francisco, I had the amazing privileged of visiting the Disney Family Museum. My runDisney buddy, Heather, was a volunteer at the museum and she was gracious enough to give me the insider tour. 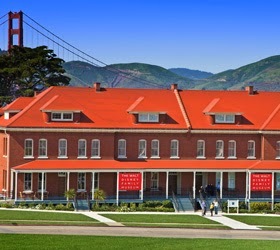 The Disney Family Museum is located in the beautiful and historic Presidio section of San Francisco. The Presidio is a former Army base turned into a center of culture and living under the shadow of the famous Golden Gate Bridge. The Disney Family Museum was opened in October 2009 as a place to tell the story of Walt Disney–his life history, his family, his legacy. Heather was waiting for me when I got to the museum. 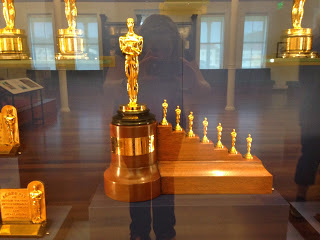 The first thing that captivated me in the lobby was the Academy Award Disney won for Snow White and the Seven Dwarfs. It was so cute–one big Academy Award with seven tiny Academy Awards. We entered the Museum and began to learn about Walt’s birth, his early years and his time in the military. The next room was all about his beginnings as an artist, still working in the Midwest. Next, museum goers enter a “train” (really an elevator) and arrive in Hollywood! Hollywood is where the Disney magic begins! Visitors get to see the invention of Oswald, and then Mickey. 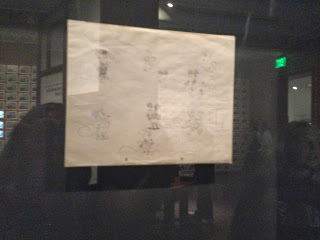 We saw the opening of Disney’ first studio. This is where Walt met Lillian, his eventual wife. The museum winds to show Disney’s venture into full length feature films, and then live action films. They have one of only three of the multi plane camera in existence, a technology invented by Walt Disney. The museum does not sugar coat anything. They go into the effects of the World War on the studios, and the artist strikes. The next part of the Disney Family Museum goes into the concept and idea of Disneyland! They have the exact bench from Griffith Park in Los Angeles that Walt was sitting on when he thought up the original idea for Disneyland, while he was watching his girls play on the merry go round. There are beginning mock ups of the park, concept art and lots of models. After Disneyland was opened, Walt set his sights on a bigger, better park–Disney World in Florida. The last part of the museum, the saddest part, goes into Walt’s death. Visitors get to see concepts and ventures that the company was working on, but scraped after Walt’s death. For me, the most touching exhibits at the museum are the simple, every day items that Walt Disney owned and used every day of his life. 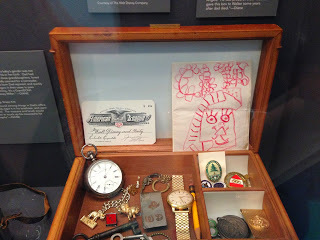 The museum has his pocket watch, his glasses, pictures his girls drew for him when they were children. These things humanize him. Even though he was a man of amazing vision and success, deep down he was a family man, a regular guy. The Disney Family Museum was nothing like I expected. 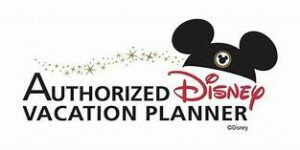 I was expecting a “One Man’s Dream” video presentation like at Hollywood Studios in Walt Disney World type of thing, but with props. It was so much more that that. Through this museum experience visitors get to know the Disney family as people. On the walls are photos of the family–at home, on holidays, on vacation, at work. Walt’s personality comes alive there. The Disney Family Museum is all about the man Walt Disney was, not just the extraordinary things he did. If you ever get a chance, go visit the Disney Family Museum! It was an amazing experience.